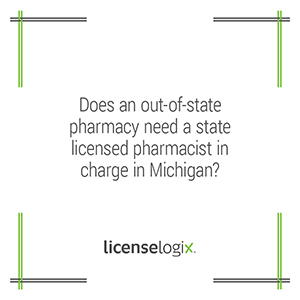 Effective September 30th, 2014, all Out-of-State Pharmacies licensed in Michigan must have a Pharmacists-in-Charge (PIC) licensed in Michigan. As stated in Sec. 333.17748 (2) "A pharmacy shall designate a pharmacist licensed in this state as the pharmacist in charge for the pharmacy." The board has not set a deadline for when Out-of-State Pharmacies must have the MI licensed PIC in place, although it will likely be required by the pharmacies renewal date. Out-of-State Pharmacies are urged to begin the process of securing a MI licensed PIC as soon as possible. The law also requires sterile compounding pharmacies provide proof of verification of current accreditation through the Pharmacy Compounding Accreditation Board (PCAB) or proof of compliance with USP standards at the time of their next renewal. Additionally, all Out-of-State licensed Manufacturer/Wholesaler Distributors are required to identify their Pharmacist-in-Charge (PIC). The PIC may be an out-of-state licensed Pharmacist. As stated in Sec. 333.17748 (2) "A manufacturer or wholesale distributor shall designate a pharmacist licensed in or outside of this state as the pharmacist in charge for the manufacturer or wholesale distributor." The Out-of-State Manufacturer/Wholesale Distributor will be required to identify it's Pharmacists-in-Charge by downloading and submitting a form to the board. The form is not yet available on the website and a deadline has not yet been set, however the Board advises licensees ensure they meet this requirement as soon as possible. For the full law click here. LicenseLogix can prepare and file all license applications on your behalf. To get started today, fill out the box on the right or call us at (800)292-0909.